The Cathode Ray Oscilloscope is a common electronic device used to study waveforms, measure voltage and short intervals of time. This amplifies the deflection of electron beam. The amount of deflection depends on the input voltage at Y-plates. Y-gain also determines the sensitivity of the oscilloscope. A Y-gain of 1.0 V/div means that for an input of 2.5 V, the deflection would be 2.5 divisions (= 2.5 / 1.0 = 2.5). When time base is on, a voltage is applied to the X-plate. Time base controls the speed at which the electron beam sweep across the screen from left to right horizontally, then jump back to left plate and the sweeping repeats. This is done by altering the frequency of the time base. Time base frequency is 25 Hz means the electron beam sweeps across the screen 25 times in one second. Note that each screen of C.R.O has a fixed number of divisions, i.e. 8. This means each time the electron beam sweeps across the screen, it moves 8 divisions. Therefore, in one second, it sweeps across 25 * 8 = 200 divisions. So time base = 1 / 200 = 0.005 s/div = 5 ms/div. 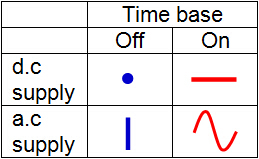 Note that Y-gain and Time base are similar to the scale of a graph. ﻿Y-gain is for y-axis ﻿while ﻿Time base is for x-axis﻿. When time base is off, CRO can actually be used as a voltmeter. The voltage to be measured is applied to the Y-plates via the Y-input terminals. By doing so, an electric field is set up between the Y-plates, and the electron beam would sweep towards the positively charged Y-plate. The deflection of electron beam by electric field is proportional to the applied voltage. By adjusting Y-gain, the height of trace can be magnified so that its magnitude is easily to be read off. When time base is on, C.R.O can be used to measure a short interval of time. One of the examples is to measure the time taken for sound to travel a distance and hence find the speed of sound. Setup the apparatus as shown. The microphone first produces a pulse of sound (first pulse on C.R.O), and this pulse is reflected by the wall and is again received by the microphone (second pulse on C.R.O). The distance t between two pulses on C.R.O is actually the time taken for the sound to travel from the microphone to the wall and back. Thus, speed of sound = 2d / t.
Note that the height of second pulse is smaller than that of first pulse because ﻿some energy is lost﻿ to the medium and the reflecting wall. When time base is on and input is an a.c supply. 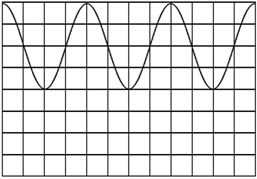 Increase the Y-gain / time base / frequency of a.c supply would reduce the size of trace or waveform. (a) Explain how the electron beam can be deflected to any spot on the fluorescent screen. (b) A waveform is displayed on the C.R.O screen as shown. The Y-gain control and time base are set to 4 V/div and 1.5 ms/div. (i) State its peak voltage. (iii) Below Figure shows a new display of the same waveform when the C.R.O is adjusted. Describe in detail what changes were made on the controls on the C.R.O to produce the new displayed waveform. (a) Potential differences are applied to X and Y plates respectively to deflect the electron beam horizontally or vertically.